Although Nepal is a country that is relatively cheaper than most, you can still end up spending a hefty amount while you are visiting the country. And albeit being quite naturally beautiful and rich in resources, the country is still a developing one. And with this revelation comes the fact that if you haven’t ever visited Nepal before, you are bound to get a culture shock when you do for the first time. Most importantly, if you are travelling on a bag-packer’s budget, then spending as little as possible is vital, even when you are visiting a country like Nepal which is much cheaper in comparison to other destinations in Asia. Likewise, the Everest Base Camp Trek is one of the most famous trekking journeys in Nepal. It can be done via a number of ways- you can contact a local travel agency that will arrange everything for you, you can ditch the travel agency all together and hire a porter yourself and do the trip, or do the trip entirely on your own. Either way, the point here is that doing the Everest Base Camp Trek is definitely worth your time and effort. Not only does the trek present some of the most stunning Himalayan views, but it also lets you experience the legendary Sherpa culture of Nepal’s mountains up close. The landscape of the Khumbu- the region of Nepal where the trek takes place, is also quite beautiful. You go through the Natural World Heritage Site that is the Sagarmatha National Park, you visit famous mountain towns like Namche Bazaar and villages like Tengboche, you hike to natural vantage points like Kalapatthar (which by the way, offers absolutely splendid panoramic views of the entire Mount Everest massif), and you hike along many ethnic Sherpa settlements and two major river valleys. Overall, it is without a doubt, well-deserving of its popularity. Every year, thousands of people from all over the world visit Nepal to do the Everest Base Camp Trek. Since a large amount of the Khumbu’s area falls under the protection of the Sagarmatha National Park, the local people who reside in the Khumbu basically have to abide by the rules of the park. And one of the rules that the park implies is that no animals can be harmed under the park’s parameters. This means that you basically cannot slaughter animals for consumption while you are inside the Sagarmatha National Park. However, all of the accommodations in the mountains while trekking offer non-vegetarian meals (along with vegetarian ones). This is possible because the meat is transported to the mountains from the cities. As the meat is transported, on the backs of animals like yaks and donkeys because cars are difficult and next to impossible to drive in the Himalayan terrain of the Khumbu, those said meats can end up being packed in the crates for a number of days. Bottom line is- they are not always fresh. Thus, in order to avoid having diarrhea, it is best to just stick to vegetarian meals. One of the best meals that you can have while trekking is rice and lentils. Rice is practically the staple food of the country and can be found everywhere. Moreover, rice is nourishing and filling. It gives you the energy to keep hiking for extended hours of time during the trek. 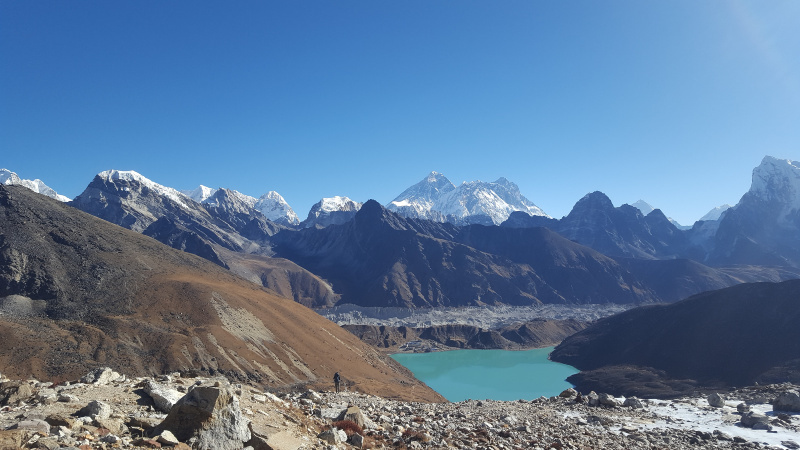 When you do the Everest Base Camp Trek and find yourself gaining altitude each moment you continue further, you will find that the higher the altitude is, the higher the cost of goods in the shops are. And this includes drinking water. If you want to save money on drinking water and don’t want to buy expensive bottled water every time you are thirsty (which is basically every hour as you are hiking on a Himalayan terrain upwards), it is best to just carry your own water-purifying tablets with you. There are number of natural water resource along the way in the form of Himalayan rivers, village wells or even open taps that just gush river water non-stop, and you can fill up your bottle and add the purifying tablet. This way, you will save a lot of money on buying bottled water bottles every time you are parched. This one is pretty obvious. The Khumbu is a remote region. The Himalayan villages of the Khumbu are even more so. Apart from the commercial hub of the region, i.e., Namche Bazaar and the villages before it like Lukla and Phakding, the rest of the villages are pretty… well, village-like. It is extremely difficult to find money exchange centers in the mountains. So it is best if you exchange the currency to local money beforehand. Doing so will allow you to buy things without going through unnecessary hassles. The thing about the Everest Base Camp Trek is that it is a genuine outdoor Himalayan adventure. You go through some rough terrains and there’s a lot of extended hiking from one location to the next. In this circumstance, it is best if you pack lightly. Only pack the absolute necessities. Don’t pack your expensive giant bottle of shampoo, nor that stylish Puma Boot that is extremely fashionable but ultimately will serve no real purpose while trekking except making your duffle-bag heavier. If you want to successfully do the trek, packing the right way is important. Moreover, if you plan on getting to Lukla from Kathmandu (which is the most ideal way of reaching the Khumbu from the capital, with other alternate option being hiking from Kathmandu to Lukla which takes about 3 days), then you cannot take baggage that exceeds the weight limit of 15 kg per passenger. Correction, you can take baggage that exceeds the weight limit, but you have to pay extra. Not worth it. Packing les and light is the best way to go. Besides, hauling heavy baggage up the Himalayan terrain isn’t exactly a pleasant time. Acclimatization is when you let your body adjust to the high altitude conditions. Acclimatization is important and it plays the most important role in making or breaking the trek. If you don’t acclimatize properly and basically decide to pull a Sonic-the-hedgehog as you push through, then you make yourself vulnerable to suffering from Altitude Mountain Sickness. AMS is a sickness that people suffer from when they are exposed to higher elevations. Some symptoms of AMS include loss of appetite, nausea, headache and dizziness. If the symptoms become severe and if it isn’t treated properly, then it can become fatal as well. That is why acclimatization is important. The best places to acclimatize for the Everest Base Camp Trek is at Namche Bazaar, Tengboche and Dingboche. But generally, if you are not under a tight schedule or anything, then you can just decide to acclimatize at any settlement for as long as you prefer. Trekkers spend an extra day at Namche Bazaar and Dingboche specially while doing the trek.